This is one of the most cleansing nasal sprays we’ve ever used. Powered by essential oils like sage, bay leaf, clove, and oregano, the natural nasal wash kills fungus and clears out the sinus infection for easy breathing. Even better, it’s safe for everyday use to support your sinuses. This wild spice oil is made with powerful herbs like oregano, cumin, sage, and bay leaf to naturally boost white blood cell count and enhance the immune system. It’s the only maximum strength spice oil that provides a gradual release of minerals and nutrients, making it highly effective. One to two capsules daily is all you need to fight that pesky cold. A little oil goes a long way with this natural antibiotic made from 100% wild oregano. 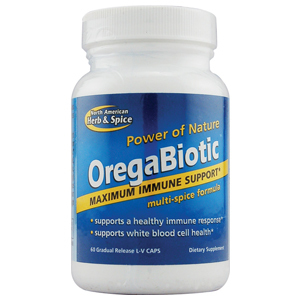 From curing respiratory infections to digestive issues, Oreganol is our go-to for destroying germs and healing the body. It’s antifungal, antibacterial, antiviral, and antiparasitic properties make it the perfect solution to naturally heal what ails you. Try it in tincture or soft gel form for incredible results. Joint inflammation such as arthritis can make movement stiff and painful. To protect the joints and reduce inflammation we like to use Canacurmin oil. Derived from 100% wild turmeric and raw hemp stalk extract, it’s a potent formula that boosts immunity, supports cellular function, and protects the nervous system. Add a few drops under your tongue for quick absorption and maximum benefits. Who else struggles to get a good night’s rest? Ditch the traditional sleeping pills and grab Hempanol PM instead. It combines 100% raw organic hemp oil, chamomile and hops - to relax the body and support sleep function. With CO2 extraction, all of the key ingredients are captured for high potency and absorption. Take five drops under your tongue or in juice/water right before bedtime to promote deep sleep. One phrase comes to mind for Purely-C, “top of the line.” It’s the only 100% food-source vitamin c plus flavonoids available. Its unique powers build up the immune system to fight off sickness. Take two capsules for immune support or more to help kick a common cold. Shake things up by opening the contents of the capsules into your favorite smoothie for a quick energy boost.